I have about a half dozen issues of this magazine and most of the articles are like this. I’m pretty sure around 1958 they changed the title to “Profiles in Sadness”. 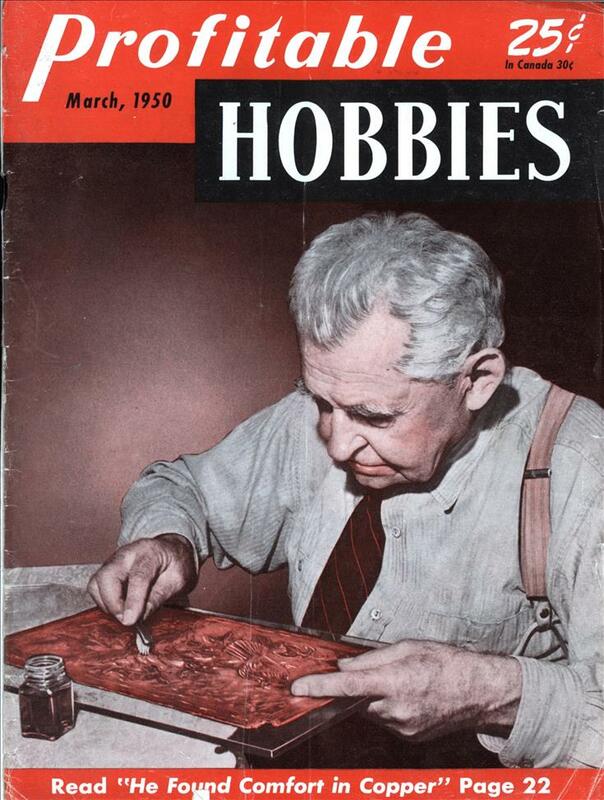 JOHN S. KREUTZER of Brooklyn, New York, has found an exciting and creative hobby to fill the lonely hours of his now solitary life. The 70-year-old naturalized American, who came to the United States in 1905 from a part of Hungary, which is now Czechoslovakia, has worked as a tool and die maker for the greater part of his life. Today retired, John Kreutzer creates outstanding pictures, trays and decorations for glasses out of sheet copper. After his wife’s death, three years ago, Kreutzer was left very lonely and disconsolate. When he complained to his daughter, a schoolteacher, who had been in China until recently, she suggested that he take up a hobby, especially since her father had always shown an artistic talent. 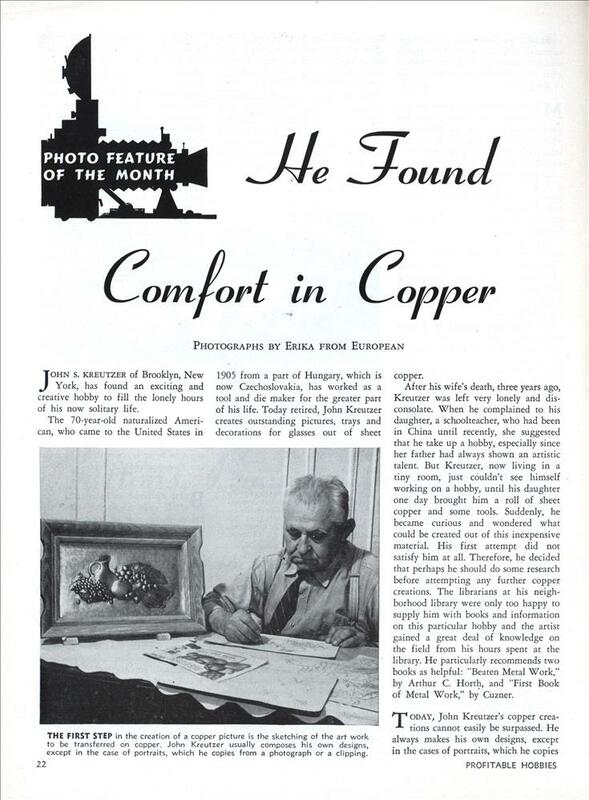 But Kreutzer, now living in a tiny room, just couldn’t see himself working on a hobby, until his daughter one day brought him a roll of sheet copper and some tools. Suddenly, he became curious and wondered what could be created out of this inexpensive material. His first attempt did not satisfy him at all. Therefore, he decided that perhaps he should do some research before attempting any further copper creations. The librarians at his neighborhood library were only too happy to supply him with books and information on this particular hobby and the artist gained a great deal of knowledge on the field from his hours spent at the library. He particularly recommends two books as helpful: “Beaten Metal Work,” by Arthur C. Horth, and “First Book of Metal Work,” by Cuzner. Today, John Kreutzer’s copper creations cannot easily be surpassed. He always makes his own designs, except in the cases of portraits, which he copies from a photograph or a clipping. After the sketch is made, it is transferred on the back of a copper sheet; after that comes the bossing process by which the picture is actually hammered into or lifted out of the copper sheet. Next, an oxidizing liquid is brushed onto the surface of the picture, which turns the copper black. Now the actual art work begins—the erasing or cleaning of the picture. Here Kreutzer shows his artistic skill by producing beautiful lines and shadows on his copper surfaces. To make the picture permanent, the finished product is lacquered, then the edges are bent and the artpiece is fitted into a frame or tray, both also manufactured by Kreutzer himself. Among his large collection of copper-works, John Kreutzer has outstanding portraits of various personalities, such as Franklin D. Roosevelt and Jimmy Durante, the Iwo Jima flag raising, various still life designs and numerous others. Since his recent exhibition at the Hobby Show for Old-timers at the New York Museum of Natural History, Kreutzer is constantly receiving orders and requests for copper pictures, trays and glasses. His prices for pictures range from $10 to $30, according to size.